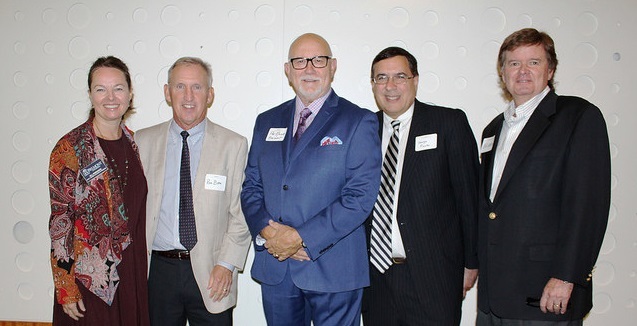 Belmont University’s Jack C. Massey College of Business recently sponsored the Young Leaders Council’s (YLC) Fall Leadership Luncheon, held in the Music City Center’s Davidson Ballroom. A sold-out crowd of nearly 400 YLC alumni, current class participants and community leaders filled the room for the annual event. While attendees filled out name tags in the hallway outside the ballroom, MBA students from the College of Business handed out complimentary Massey business card holders. YLC Executive Director Diane Hayes, who has led the organization through substantial growth over the past 22 years, welcomed attendees and emphasized the importance of YLC alumni. Board Chair Santi Tefel (Class 54) highlighted the importance of this year and its partnerships, including the Massey Graduate School Alumni Class which met for the first time this spring. Tefel then presented YLC’s inaugural Hero of the Year award to Beth Torres, president and CEO of Make-A-Wish Middle Tennessee, for increasing the operational budget from $1.3 million to $3 million and granting 140 wishes to children with life-threatening medical conditions in 2017, the most wishes the organization has granted in one year. Tim Bewley (Class 53), 2016 Young Leader of the Year recipient, then presented YLC’s highest honor of the year to Justin D. Crosslin, Jr., CPA, MBA (Class 53), co-managing principal of Crosslin. Dean of College of Business Dr. Pat Raines then spoke about Belmont’s commitment as a luncheon speaker sponsor for the past 10 years before introducing Belmont’s Bruins Men’s Head Basketball Coach Rick Byrd and Associate Athletic Director of Marketing George Plaster, the event’s speakers. Plaster opened the conversation with accolades and stories before Coach Byrd shared his philosophy behind teaching his players more than just on-the-court strategy. Looking beyond a player’s talent, Coach evaluates his team’s character. With this in mind, he said he strives to have a locker room full of young men who respect each other, a team aspect he believes equates to more wins. For more information on YLC, click here.